1. Circumference is measured at breast height (1.37 m or 4.5 feet above ground level or the germination point). If a burl or obstruction makes this location unsuitable or unrepresentative, measure at the most suitable point and make note of the actual measurement height. If your measuring tape is too stiff or too short, you can use a string or rope, but make sure it is made of non-stretch material. 2. If the tree forks at or below 1.37 m, record circumference at the narrowest place below the lowest fork. Make note of the actual measurement height. If this puts the measurement location on the ground, the trees should be considered separate individuals. 3. If the tree is on a slope, measure circumference at 1.37m up the trunk on both the high and the low sides of the slope. Record the average of these two measurements. If the tree is on a steep slope, take one measurement. This measurement should be taken at 1.37m up from the midpoint of the trunk (the estimated germination point of the tree). If the slope is extreme, you may need to measure circumference higher up. Always make note of the measurement height if it differs from 1.37m. 4. 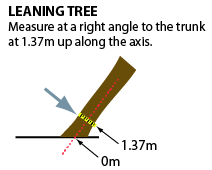 If the tree is leaning, circumference measurements should be taken at 1.37m up from the axis of the tree base, following the lean of the trunk. Circumference must be measured at a right angle to the trunk, otherwise circumference will be overestimated.